Why did you decide to create a printed magazine, and what opportunities did going into print offer you that you couldn’t explore online or in your other MOLD activities? LinYee Yuan: Print offers a unique form of storytelling that invites an audience to consider text, art and materiality in a beautiful, compact format. When I decided to produce a print magazine, I had already been publishing stories online for three years that explored the boundaries of food design and the responsibility that designers might have in offering solutions to the coming food crisis. Still, it didn’t feel like a clear call to action around the possibilities for design to be an agent of change within our food system. 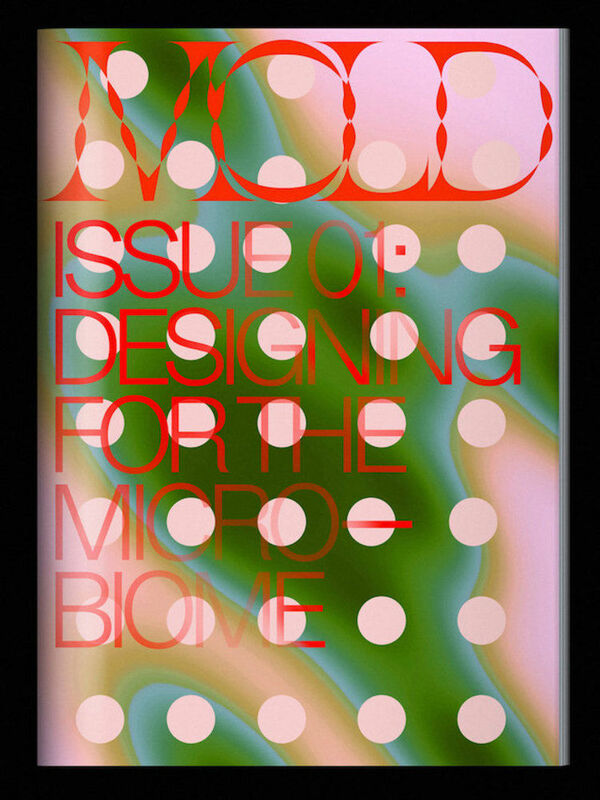 I love print and started my career with print publications, so the impetus behind MOLD Magazine was to create an opportunity where we could do an in-depth exploration around a single idea and the myriad ways that designers might affect how we eat and drink in the future. 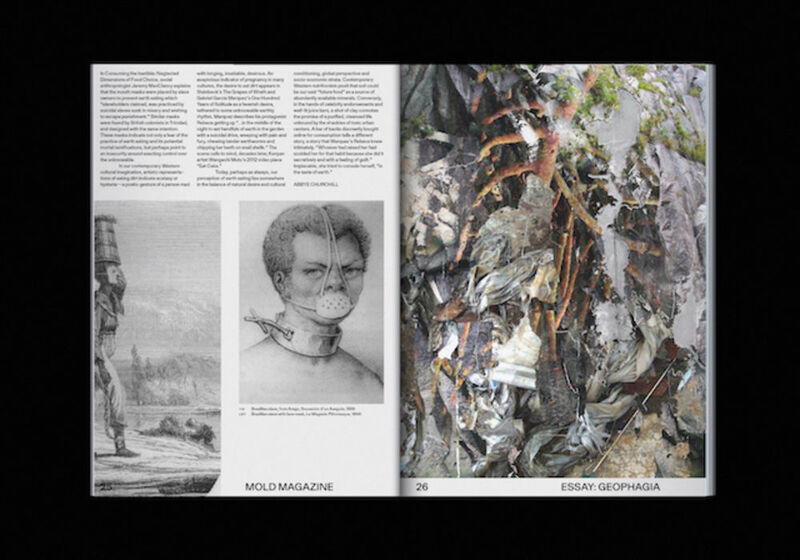 MOLD’s design takes a refreshing step away from the established look of food-focused books and magazines—did you deliberately set out to avoid existing tropes within this field? Eric Hu: That's a good question. Yes and no. You're not really boycotting a business if you never intended to shop there in the first place. There would never be a situation where Matthew and I would design something that would look like Bon Appetite or Eater or any other major food publication by choice. It just doesn't fit with our taste or experience. At the same time, MOLD in many ways is a response to foodie culture and its many fetishizations, so naturally, going for something that is a visual 180˚ from that world is a quick shorthand to the viewer that it intends to set itself apart. The magazine is "The future of food". The design took more cues from the word "future" rather than the word "food." The publication isn't about recipes or restaurant reviews, it's about the real consequences that eating will play in our lives in the coming decades. The design should be an accelerationist reflection of that. Tell us about the bespoke typeface used in MOLD issue one—how did you develop it and why, and will it be used for every issue? Eric Hu: Everyone keeps asking us about that typeface, but it's actually a free font that Ellmer Stefan made called Gyrator. Last year he decided to design one font per week inspired by these 19th-century specimens he came across. I guess it's cool people thought it was bespoke, it means that we really owned it, but credit should go to Ellmer for the design. If there's anything we can take credit for, it's the willingness to put that typeface in an unexpected context. Trying to make something look futuristic or even contemporary by using a typeface that's clearly meant to signify Victorian aesthetics isn't the most intuitive decision and there's a lot of rationale behind why we did that, but without even going into all that, the truth is that Matthew and I enjoy a good challenge. 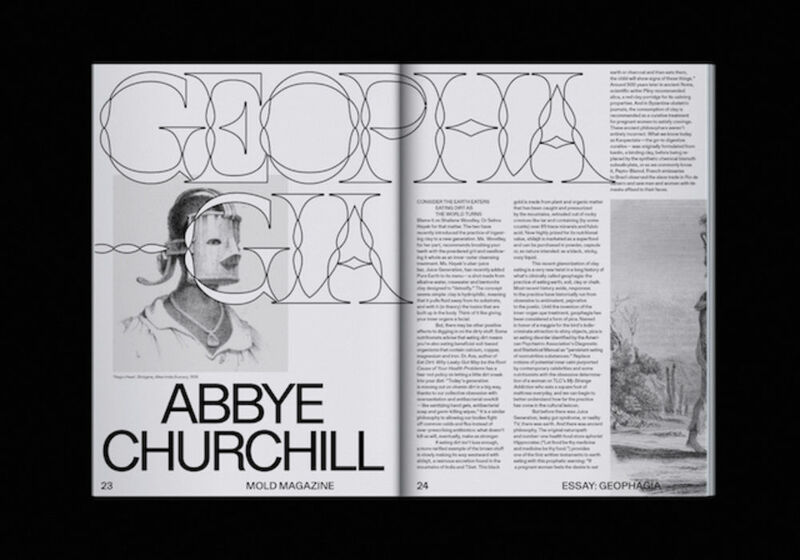 Gyrator is beautifully drawn, as are all of Ellmer's designs, but it's also a very opinionated typeface. It's part of a large and rather vague "this is cool but I don't know where I would use it," genre of fonts. There are some typefaces with less personality and more utility, like a contemporary geometric sans-serif, that make it feel like you're designing in Easy Mode sometimes. Like it's going to look decent no matter what. I get bored easily and sometimes I just want a challenge. As for whether or not it'll be on every issue, I don't know, but definitely not like how it was used in the first issue. I think we really pushed the typeface to its limits and it's not exciting to keep going down the same path. In many ways, the first issue was a proof of concept but with that, the gestures had to be bolder. I think as MOLD creates more issues, it will be afforded a nuance that time allows. It's a marathon and not a race and naturally, voices can have more range if they know they're being heard. But in the beginning, in order to make it clear what you stand for, you have to be loud. Can you tell us more about the approach you have taken to the use of images throughout Mold, and how you chose the illustrators, artists and photographers you worked with to create the visuals throughout the magazine? Eric Hu: With the first issue, it was really about being agile and with that it required us to tap into our own networks of people we admired and were willing to work with us with limited resources. Now that we're funded and it's on the second issue, we can be more thoughtful with our collaborators. The next issue will definitely feature a more inclusive and varied lineup of artists. Your contributors come from an incredibly diverse, international range of professional backgrounds. How did you go about selecting them and building the contents list for MOLD issue 1? LinYee Yuan: The diversity of ideas and geographies is central to our mission. By the year 2050, the UN predicts that we won’t be able to produce enough food for a population of 9 billion people. This coming food crisis will affect all of us and it will take the best that science, technology, agronomy, gastronomy and design has to offer for us to address the crisis. It’s also why I co-edit the magazine with Dr. Johnny Drain, who is based in London, and has a perspective that comes from both the worlds of gastronomy and science. Do you have a structure of regular features or formats for MOLD, or do you intend to be more flexible with each issue and be led by your topic and your submissions? 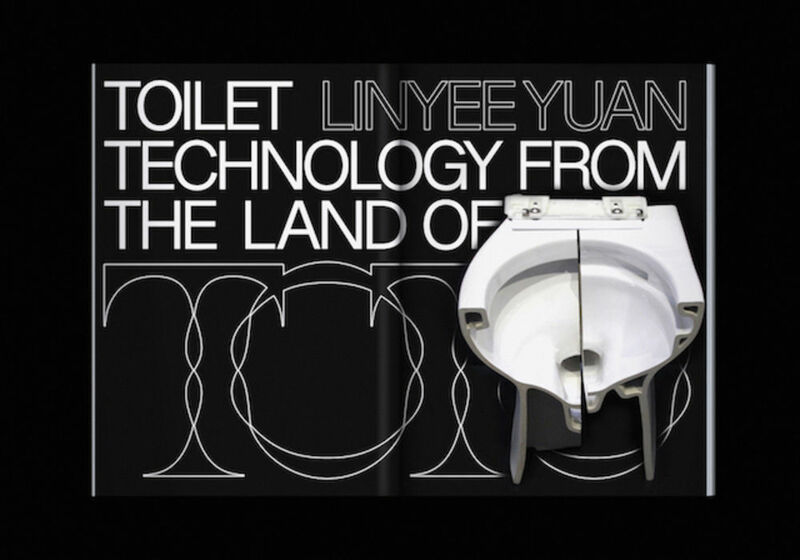 LinYee Yuan: We have four sections of content in the debut issue: Perspectives, Culture, Products and Features, and we are carrying this format into the second issue. The content mix of the first issue really defined these sections for us, as we wanted to include first person storytelling from thought leaders in their respective fields (Perspectives), foreground the way that culture shapes our relationship with food (Culture), highlight the breadth of design projects that are inspiring our explorations (Products) and give space to long-form writing and more expansive visual storytelling in our Features. The freedom that comes with self-publishing means that we might change it up moving forward, but the format works for us now. Has having a printed magazine changed the way you think about or approach your online activities and web-based content? How do the two sit together? LinYee Yuan: The magazine is bi-annual so it has a whole separate track for production—story research, writing, art, design, publishing—than the digital platform. One supports the other, but I see the magazine more as an object that will document some of the ideas and projects at a critical moment in our relationship with what, how and why we eat. These stories hint at what’s to come as we turn our attention to proposing solutions, big and small, for feeding 9 billion people by the year 2050.